As Shawn Achor describes in his book The Happiness Advantage, a recent scientific study showed that doctors who are put in a positive mood before making a diagnosis consistently experience significant boosts to their intellectual abilities than doctors in a neutral state, which allows them to make accurate diagnoses almost 20% faster. The same study then shifted to other vocations and found that optimistic salespeople outsell their pessimistic counterparts by over 50%. Students primed to feel happy before taking math tests substantially outperform their neutral peers. So it turns out that our minds are literally hardwired to perform at their best not when they are negative, or even neutral, but when they are positive. TOTALLY bookmarking this post. Thanks for all the helpful tips! Whew! My mind has expanded enormously reading this post. I agree and attempt to practice faithfully #1, having a consistent morning routine. Too easy to let the demands of others shortstop my walk with the dogs, quiet time in the Word and connection with my husband. When those go out the window, something just doesn’t feel right when I sit down to write. Thank you for this…will take awhile to digest and incorporate. I really want to thank you for all your free advice! At a time when I had no money, no job, low self esteem and seriously on a roller coaster to hell, there was nobody prepared to help me as I had no money for a life coach or any counseling. After reading all your emails and following your teachings, you have changed my life! You gave me hope and determination and I have structured my life and “code” according to your teachings and I am well on my way to success. You helped me when everyone else turned away. I WILL BE BUYING ALL YOUR BOOKS! Thank you so much! All points well taken, but #1 is a gem! Thank you for sharing such a silver lining article. Some people may think this blog is just preaching but in fact , it has tangible realities , proofs . They learn by stretching themselves to their limits. we should do the same . and then .. The floor is ours .. There are many books and articles that preach about how wealthy and prosperous individuals have achieved their level of success. Main points in most of these articles very often coincide and I should say that it’s because they really do work. 1)Things like having a calm consistent morning routine instead of experiencing all sorts of frenzied emotions at the very beginning of the day is a very good tip. If you’re already feeling stressed when you hear your alarm dinging in the morning, it’s very likely you’re going to feel stressed during the rest of the day. 2)Eliminating all needless busywork is extremely important as well. We should concentrate on our key priorities and milestones. Try to spend your time mastering things that are really noteworthy and not waste your precious time and energy. 3)One of the notable features that many successful posses is being resilient. They can turn their hardships and gut-wrenching experiences into life lessons and sources of motivation. Instead of being focused on their failures they learn from their mistakes and keep moving forward. Stumbling and failing should never bring you down. Successful people are able to find the silver lining in every situation. They know how to focuss on positive things instead of dwelling on the negative emotions. Nothing can shatter their confidence and determination because they can reboot their perspective on certain things. 4) All the successful individuals don’t let other people’s negativity get to them. Yes, they welcome constructive critisism and even solicit honest feedback but only from people whose opinion they value. Mean and negative comments never affect their confidence and determination. 4)Breaking out of your comfort zone. It triggers you to work on your skills and to improve yourself. Do something you feel nervous to be doing, something you think everyone might judge or poke fun at. It will noticeably boost your confidence. We learn when we’re in our discomfort zone. If you’re struggling you’re growing stronger and smarter. And also becoming more experienced. 5)Working on a regular basis. Some people think that they are naturally not cut out for being succesful because let’s say they are too shy. You can not be hard-wired for success. It’s 10% talent and 90% work. Stretching yourself to your limits, improving yourself and being diligent is conducive to your future success. 6)Keeping a list of all of your achivements and future goals. First can be a tandible reminder of something you’re proud of, second one- what you strive to accomplish. Also it’s great to have a notebook where you can write down all of the highlights and difficulties of your life and how you deal with them. 7)One of the tips that I would add myself would be never settling down for something mediocre. Being a perfectionist is not always a good thing, but it is in case when it comes to your dreams and passions. Always strive for the best. Seek out opportunities everywhere. 7)Having a mentor is beyond important. Someone who you inspires you, who you admire and want to be like. Someone who has what you want to achive and can show you the ropes. 8)Give yourself a break. No matter how hard-working, ambitious and determined you are everyone will go crazy after a load of constant pressure. If you get too caught up in the daily grind it might significantly affect your health and the state of your mind. Devote some time to walking in the park or reading your favorite novel. So rarely do I click on a link in a Facebook post that takes me to truly nourishing content. I found similar value, guidance and validation in this article, as I do in some of my favorite books like Think and Grow Rich by Napoloean Hill. Thanks for the post. I would add (though this prob fits into #1 as part of my morning routine) meditation. A specific learned method (I practice TM) repeated routinely on a daily basis adds immeasurable value and actually relates to several of the numbers above. They give their energy to themselves first and invest in self care. Good ideas. I’d like to create a visual reminder of my long term goals. Great post! So much of success has to do with your perception of your life’s circumstances, but also how you deal with life’s stresses and in turn, how you respond to the world around you. When it comes down to it, any tool or method that lowers your stress level, makes you more productive and simply makes you feel better is a great way to add to your success level. Love this list! Perhaps the only thing I would add would be “some form of physical activity at least 30-60 minutes per day (success and it’s efforts are irrelevant if you don’t live long enough to see it realized and enjoy your merits ;)…). Such great advice though! A definite must “share”! Best morning ritual: getting in the Word and prayer. Breakfast of the champions! Everytime I visit your blog guys (marc and angel) I am learning. Thanks guys for being a blessing and being a great example of positivity. Honestly, I remember the first time I have read a posts of yours, that was the first I feel that enthusiam inside. Like I. Don’t know how to explain it but truly thank you guys for being an angels in disguised. Rituals – or routines – are important. Every morning my wife and I take time to have our coffee together. We don’t have to talk; often we silently sit in our garden. But it serves as a time to ease into the day. Small things like this can be important, even if they sound insignificant. An article which was well thought out. Each point was taken and explained with practical steps.i was totally glued to end of the page. Good work Angel. Such guide in life always helps us to mature in a productive way . 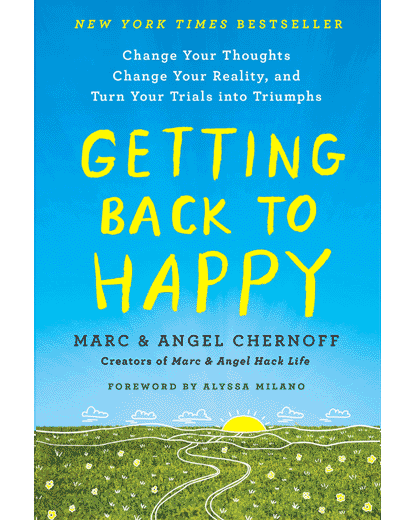 Thank you Marc & Angel for your insightful emails, and loving quotes and positivity.